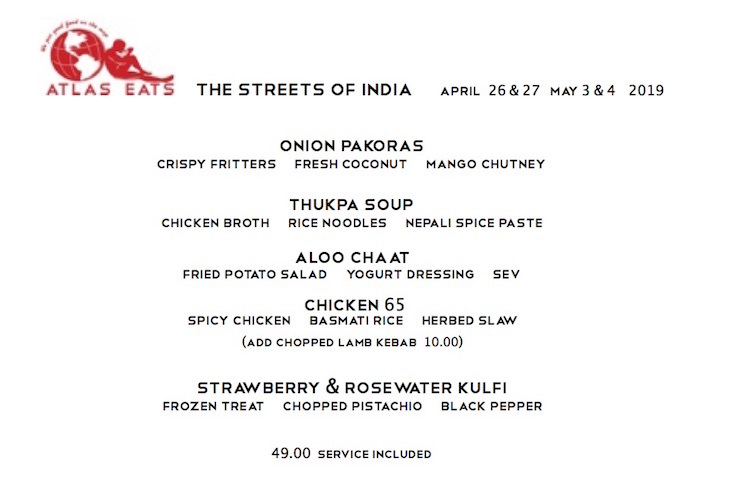 We are venturing back to the world of street food. Often this is where you discover life's most interesting and enjoyable food experiences. India has such a diverse array of ingredients and spices which can add up to a unique and delicious meal. There are two seatings: 6:00 & 8:30 pm. you can savor the flavors of India. We have a fine selection of wine & beer. Our wine service is by the quartino (1/4 liter) so you may select different wines with each course, if you like. Given the limited seating capacity of Atlas Eats, we do not allow BYOB. Please call for your place at the table. Seating is very limited. When making your reservation we will remind you that you'll receive a call for confirmation the week of your reservation. If we cannot confirm your reservation we reserve the right to release your table because of the limited number of seats and a lengthy wait list. Thank you! Click here to see past Edible Atlas Menus.